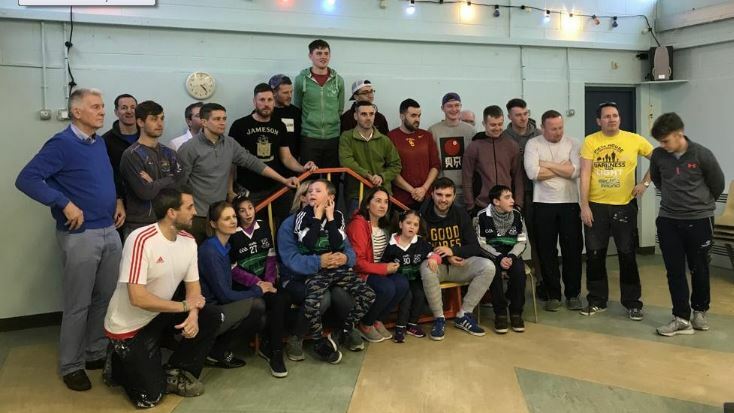 Our Senior Football team were hard at work this weekend as they volunteered to paint St Catherine’s Special School. It is great to see our club members giving back to the community. We had the pleasure of witnessing the faces of the students as they came to see their newly refurbished school! A special mention to Tony, Daire, Des and Cathal for organising the event. Thank you to everyone who offered their assistance and donated on the GoFundMe page. The generous donations allowed us to donate the leftover funds to St Catherine’s. A special thank you to Crown Paints in Bray who gave us a very generous discount on the paint (see picture below). We look forward to continuing our support of St Catherine’s in future ventures. The will face Carnew in the semi final with the date to be confirmed. Here’s hoping they can do the double after reaching the football Feile last week. 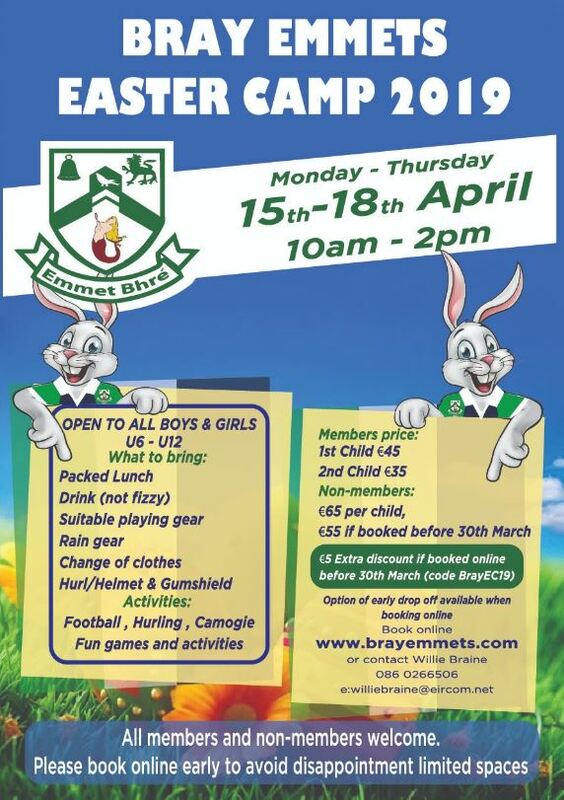 Booking is now available for our Bray Emmets Easter Camp 2019! What better way to get the kids out of the house over the Easter holidays. Please see all the details below. 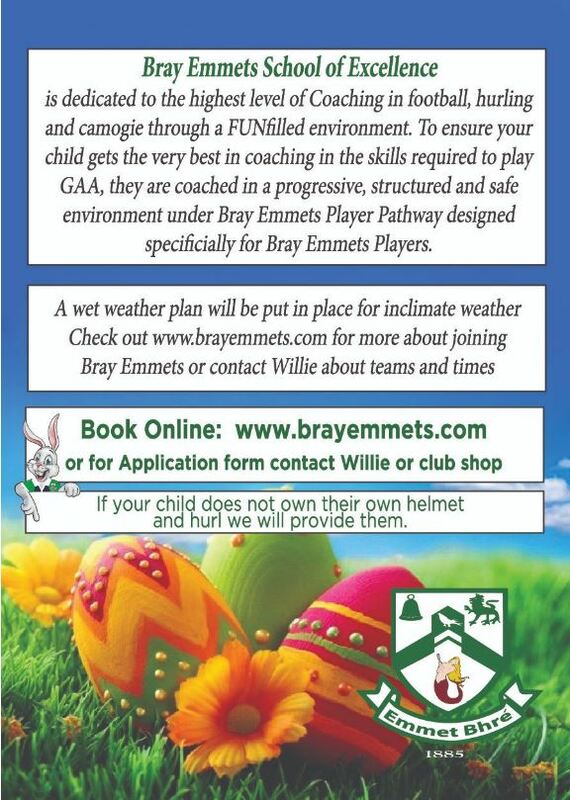 This is open to all kids, current Bray Emmets players or not. Please share the word! You can book at www.brayemmets.comor by contacting Willie Braine at [email protected]. Thank you to Bray Chamber of Commerce who awarded the club the best sports club in the St Patrick’s Day Parade! Great achievement and the club are so proud of all children, coaches parents and anyone else who helped out! Thank you to Bray Credit Union!! Bray Chamber, thanks for the support! 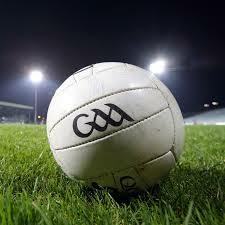 The Senior ladies had their second outing in the league on Saturday night against Arklow ladies in Arklow. 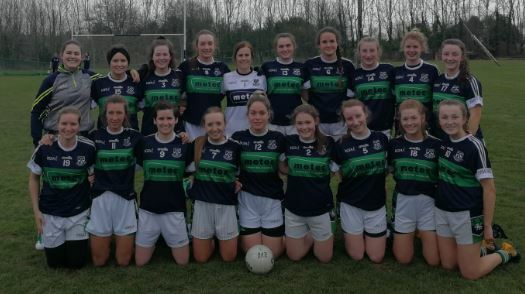 The Bray ladies won out by a point in a very entertaining game. The team as always showed lots of determination, passion and skill. Bray 2.9 to AGB 2.8. Bray Emmets wish to sincerely thank all our wonderful ladies, families, friends, local community & sponsors who supported the 2018 inaugural Ladies Lunch. A whopping €6,235 was raised! The event was an outstanding success & a most enjoyable day & night! SAVE THE DATE for the 2019 Ladies Lunch – Saturday 30th November 2019 in the Esplanade Hotel, Bray. Please mark this in your diary. The new, much bigger venue will cater for everyone who would like to go so no lovely lady will miss out on this social event of the year! 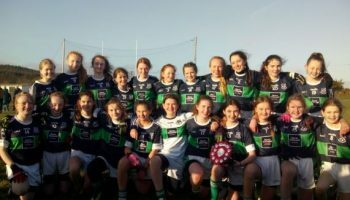 Well done to our Bray Emmets players April Harty, Emma Nesbitt and Aoibhe Traynor who had a fantastic win with Wicklow u-14 ladies today in the Leinster Championship semi-final! Well done to everyone involved! The Lotto is agrowin’! No winner this week so onwards and upwards. Congratulations to Paul Humphries who wins €25 in the Lucky Dip.